Been around these forums for a while and am back once again. Started with a 14g Biocube and upgraded to a 65 which was home to a bit of everything. Then kids happened and time was scarce and unfortunately the tank suffered and was taken down. So now, years later, I am again playing with a nano. Going to try to keep this small tank going for the long haul and try some things, here and there. So it's been up for over a week now and cycling, so nothing to do now but wait. Managed to get it going on spare parts and rock I had in the garage from what I didn't sell from the other tanks, costing me only 35 bucks for sand and spray paint. Tank was preciously freshwater. - 15g Aquaon Column tank with stock LED lighting. - Aquaclear 20 HOB with only floss right now. Not sure where this will go but starting with a small lighting upgrade. Not sure about filtration, looking to go simple with a decent water change schedule. A simple ATO may be next. Did a small lighting upgrade tonight, installed two 12" TrueLumen Pro strips. So far the color is great. I may add one more in the future. Color looks great! Post a pic of the strips, I'm curious to see what the retrofit looks like. Sure, ask and you shall receive. Looks great. 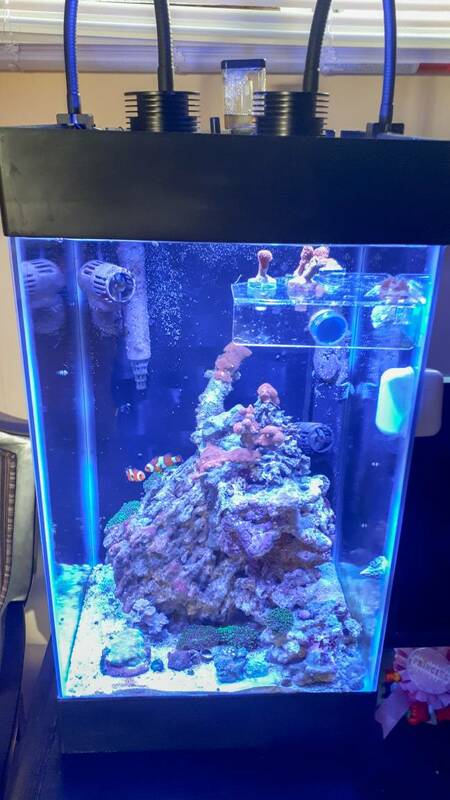 I just set up my JBJ 24 and I’m looking to upgrade to LED lights as well. My 15 column. 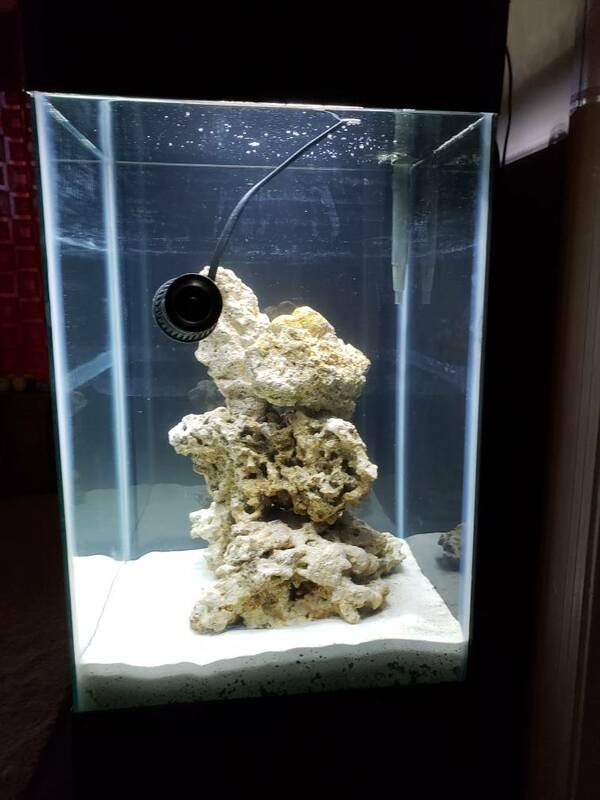 The shape provides a gee challenges but it's a great looking tank and a large volume of water in a small foot print (I get 15 gallons isn't a large volume of water) I run a aquaclear 70 with an aquaticlife 115 skimmer and chemipure blue seachem matrix and pillow stuffing for filterflos. I run 2 sunsun powerheads 428 GPU each although I'm going to upgrade to a jebao ow10 soon. I have no good and run 2 asta 20 for lighting. Keep this thread going I love seeing people with the same tanks and equipment and if I can figure out how to subscribe I will. Thanks everyone for subscribing. The 15 column is an interesting shape, it's tough to work in but it fits the spot it's in perfectly. We'll see how it works out. As for now, still watching the cycle creep by. Ammonia has zeroed out, but still waiting on the trites. Growing impatient as I want to see something in it already. Picked up a few things today following a first water change. One of the clowns is a tangerine snowflake which I got as it was marked down. Be prepared for another mini-cycle after adding this bio load!